Just thought I'd pop in to say a quick "hello". I've spent most of the afternoon sitting on my beanbag crocheting. I've now got stiff shoulders and my bum has gone to sleep. Ah well. It may not be the healthiest pastime but it sure is one of the most blissfully colourful. Hope you're having a lovely weekend, whatever you're doing. 1. I am 40 and loving it. 2. I will have been married to D for 14 years on Valentines' Day. 3. I have two children - a son of 13 and a daughter of 10. 4. I am the eldest of four children, having three younger brothers. 5. I am 5ft 6" with size 5.5 feet. 6. I am one of the most unsporty people you will every meet, though I love to dance and can still almost do the splits! 7. I am most definitely a home bird. The simple answers are the best! Sometimes the things we choose to tell say most about us! Loving your snugglt pictures too! Brilliant facts Heather, and well done on your award. Love your style by the way, you always look really beachy and chilled out. And cosy! Glad you had such a relaxing weekend, its cold out there. Nice to snuggle indoors (I say this, but have been out ALL afternoon, visiting a funky indoor market and watching the waves crash in and enjoying a post of shopping). Nice to be back in the warm. Glad to hear 40 is good. Not long to go for me! I am so glad that there is someone else out there who is unsporty!! I can't stand the idea of going to the gym and all my friends seem to love it. I prefer a walk on the downs or a boogie any day!! BTW, love the colours on that crochet! What yarn are you using?- it looks really vibrant! Loving that piece of hooky so far! What is it going to be? Can't wait to see! Hey Heather, what a wonderful way to spend an afternoon.....love the yarn colours. Always interesting to read 5 facts about bloggers....like you I'm a home bird too. 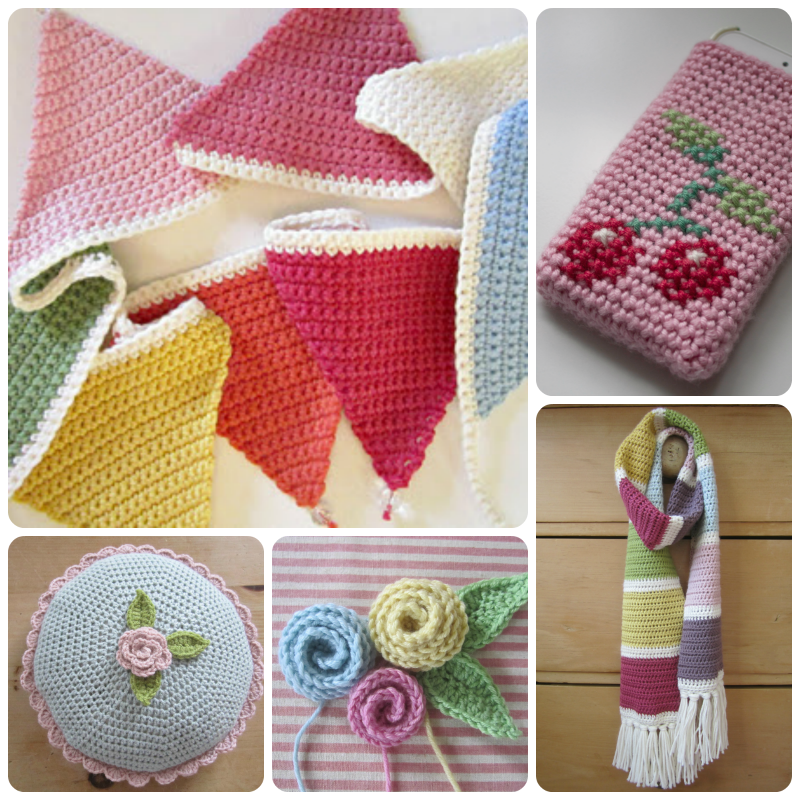 Lovely refreshing blog to read on this cold Sunday in February and beautiful colourful crochet too! Congratulations on your awards although you may not get the unsportiest person prize: that would go to me, I think. Beautiful yarn colours and a fabulous way to spend an afternoon in my opinion. I loved your blog...beautiful !!! Just started following your lovely little blog. We have a puppy too a sproker spaniel called Benji Boo! Sitting all afternoon on a beanbag and crocheting sounds like the healthiest kind of pastime to me! I am intrigued to know what you are hooking...? 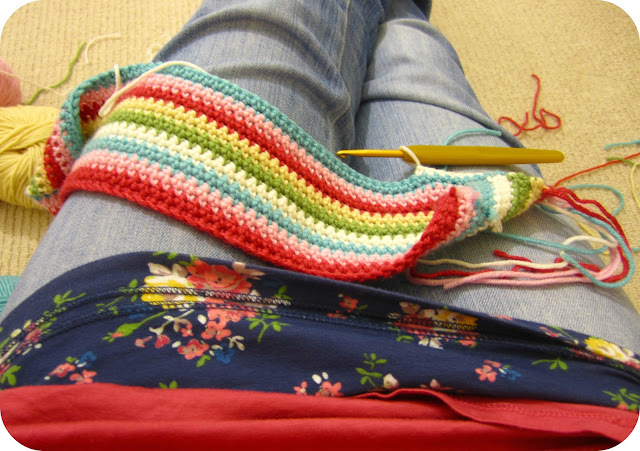 Crocheting all afternoon - aaah that sounds just perfect. Even if it means a numb bum at the end of it! I love what you're working on - great colours. Have a fab week. Love the crotchet...something I have always wanted to try as I used to see my Great Aunt and her daughter do it all the time when I was growing up. I think I saw some steps on another post of your so I will check them out. Okay, so I love these, but what do you do with your pesky little tails from each row. I struggle with them.